The Map have limitation to min pin size. But I'l think what can be done with chests icons. Actually, the original size for chests and treasures is ok, but I prefer the unknown POI and skyshards icon in size 30. If there was a console command to set a different size for each icon, that would be enough. Baertram was not right. Links to anddons that inspire me to tis work is removed. Congratulations. Even if you mined the data all yourself, which was somehow proofed isn't correct (and even if your guildmates helped they seem to have copied the exact data then somehow and provided it to you) you should at least give credit to the ideas and other addons which you have copied. If you wouldn't know they exist, alright. But you even reject to give credit on purpose which makes me sad. The users who use your work can be glad they have something working (and as I read they don't care where it comes from as long as it somehow works....). Sad but true, and thanks to MasterLenman who seems to be different. But they will run into errors with other addons, pretty sure. Because your addon isn't compatible due to the lack of libraries which assure this and where build in years of coproduction of addon devs and users. The most annoying fact is that your behaviour destroys the energy and fun that some really good addons devs, who worked for years to make this game and community better, invested here, and they get slapped in their face by your attitude. Many users might get angry if these devs abandon their addons completely because of such ignorance of single persons. Last edited by Baertram : 01/09/18 at 12:08 PM. I'm having a problem with unknown POI, it marks known set crafting stations as unknown (faded icon appears under the white standard one). This dummy icon placed to give set tooltips. But it must be hidden under original icon. I'l check it! Also, it would be great to have a chat command to select the size of the different icons separately. I like the unknown POI as big as they appear in-game, but I'd prefer the chests a little smallers so they don't clutter the map. Hi, nice addon, it works great and I appreciate that you update it regularly. Thanks for your work. Last edited by Tagonius : 01/09/18 at 07:49 AM. So you took the data from your guildmates in good faith. Well, it turns out they just gave you a copy-pasta of other addons' data. So now you should think about how to deal with this. Я, наверное, зажрался, но можно пины сундуков сделать поменьше и прозрачности добавить. Все, честмастер сношу? Теперь он сам будет запоминать? I can not say - I did not compare. Just used bosses coordinates from guildmates. My own bosses are from Clockwork City. 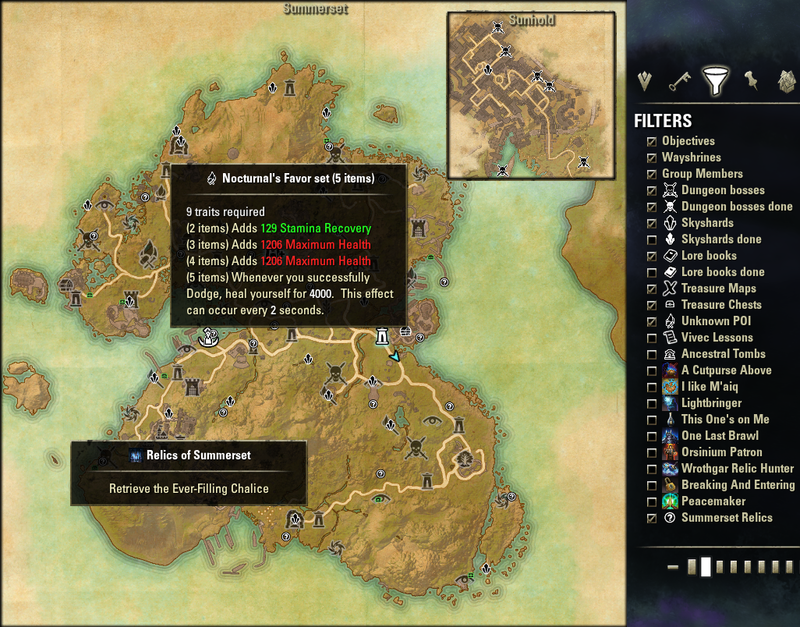 And why are the Morrowind open dungeon bosses missing? Я, наверное, зажрался, но можно пины сундуков сделать поменьше и прозрачности добавить. Вся карта белая. В идеале - иконки из честмастера взять, там они идеальны были. First I never said yes for the data. Some time ago I asked you to use data from your add-on. No answear. So no permission. And I accept this. >So you stole SkyShards, LoreBooks, LostTreasure, ChestMaster9000 data... did 99% of your addon. You did nothing for my add-on. All data was collected from open sources (forums, specialized sites), in game sources and by my guildmates. I've read your code. And nothing taken from it even methods. All was made from scratch. So. You. did. nothing. Even simple answear for my request. ChestMaster9000 have no own data. All data was collected by my guildmates. That is very hard to believe. 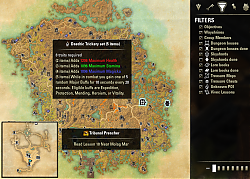 How come your coordinates for world bosses are exactly the same as in the Destinations addon? It happened by accident that exactly the same have longer coordinates (like 0.5693813562, 0.2841663659) or shorter coordinates (like 0.62, 0.61)? If you take other people's work, have the decency to give credit to them. And don't blatantly lie about it. Next time try changing every coordinate by 0.00001 or something to cover it up at least. I agree with Ungrave that the long hiatus on updates left a void, but this isn't the solution. 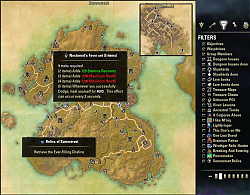 EDIT: And why are the Morrowind open dungeon bosses missing? Why didn't you datamine them as well? Of course, it has nothing to do with the fact that they aren't in Destinations right now. But fear not, they will be added soon, so you can copy them as well. Last edited by MasterLenman : 01/06/18 at 06:21 PM. Last edited by Hoft : 01/06/18 at 02:55 PM. I don't know what to think about this addon. I agree that I let it on an free licence, but since I'm here, please have the decency to have a yes. And ask. 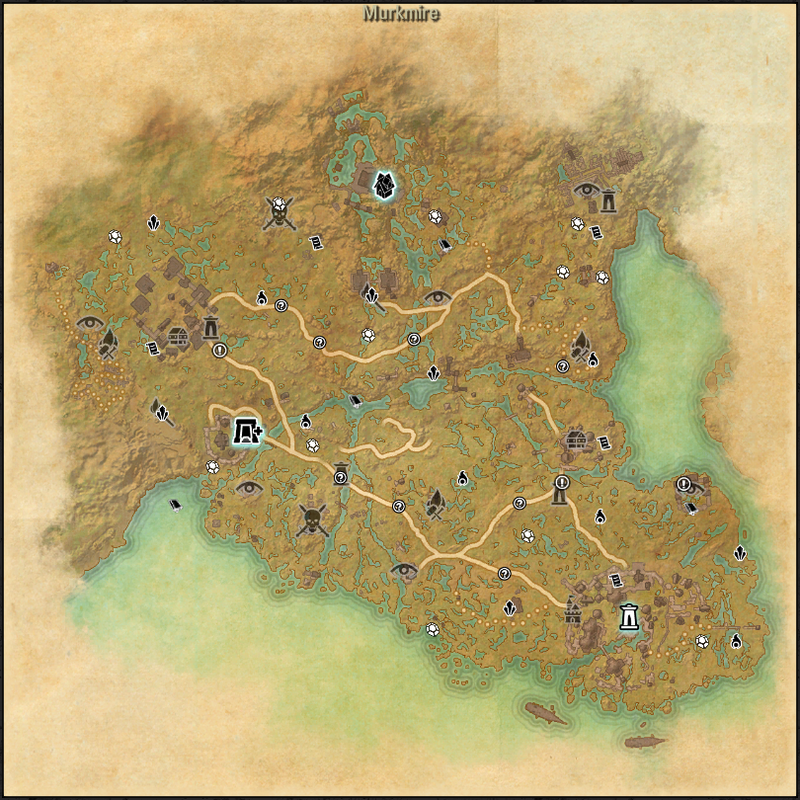 You asked if you could use skyshard data on your minimap addon. I didn't answered because a smart dev would not need to add pin data in its map addon but grab pins the others addos create. So you stole SkyShards, LoreBooks, LostTreasure, ChestMaster9000 data. 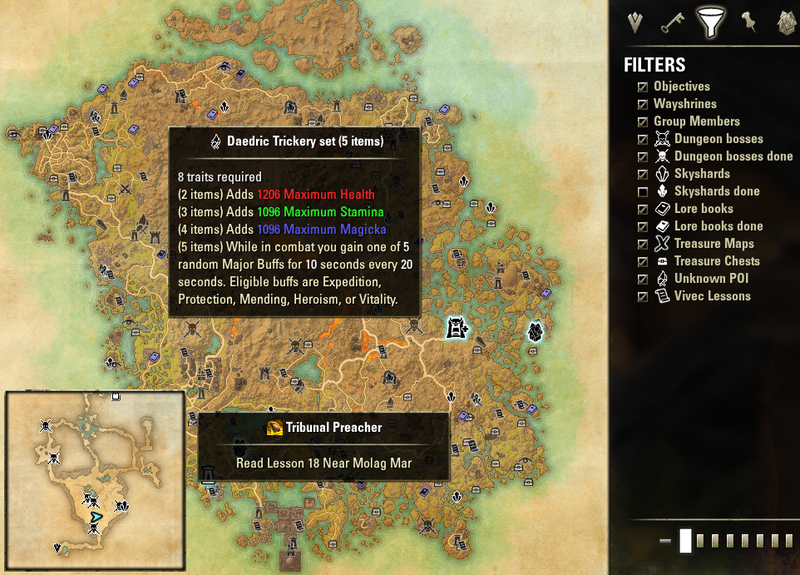 I personnaly spent years to build some of those addons and I'm really disapointed to see my work used without my agreement. Then you're not using LMP. Another thing which I don't like and will treat like the addons creators like you who doesn't give a **** about compatibility between everyone work. I've personnaly speculated on few things. Change all the data to a format that you'll not be able to use. Minify the code and the data. One of the basterd who did 99% of your addon. 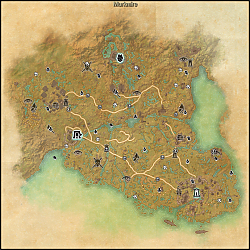 can you make the undiscovered pins/places a bit opaque? Last edited by iksaa : 01/05/18 at 06:34 PM. Hellow, first of all, your mod is amazing, thank you! can you make the undiscovered pins/places a bit opaque? like the image below. Last edited by iksaa : 01/03/18 at 04:31 PM.